My Yarra Valley adventures landed me at the lovely Soumah winery and cellar door recently. My immediate impression was that this place was very lovely, warm and cosy! The staff were so friendly and inviting, and welcomed us straight away for a tasting. Big tick in my book. Unfortunately we arrived quite late in the afternoon, so the kitchen was just closing. However I would love to return to Soumah to taste the very impressive menu, which shows that Soumah is not just your everyday cellar door! This became even more obvious as we began our tasting. We had just come from another winery, which I did not enjoy very much at all (but I’ll save that story for another time) so I think I was feeling a little discouraged. I can’t help but take it to heart when I don’t enjoy a tasting, and strangely feel disappointed in myself. I feel like I have just had a fight with my best friend, or I have asked her to look after my dog for the weekend and the gate was left open and she ran away (my dog, not my BFF). My best friend let me down. So I was feeling a bit flat, but what a perfect pick me up Soumah was! And anyone who knows me will know that if something makes reference to, or makes me think of Harry Potter, then that’s another BIG tick in my book! 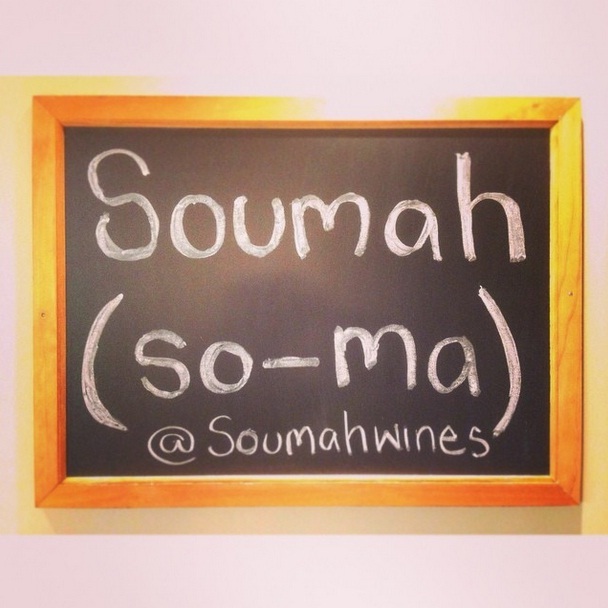 Soumah 2pts – Other Winery 0pts (for those of you playing along at home)! The wine that made a particularly charming impression on me was the 2013 Single Vineyard Chardonnay. 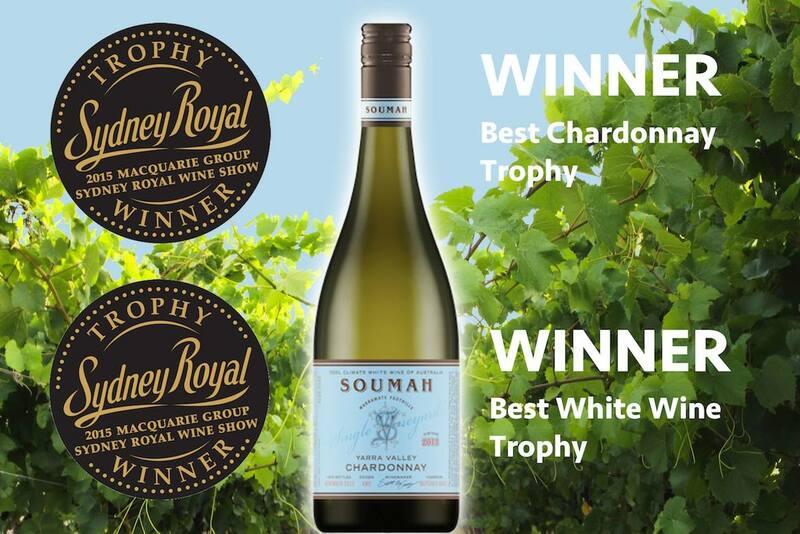 I have only recently started to enjoy Chardonnay, and this particular 2013 from Soumah is proving to me that I am making the right choice to give Chardonnay in general a chance. Seemingly like everything else in the world, wine trends are cyclical. While in the past, people would criticise Chardonnay drinkers, that trend is quickly changing. I am definitely guilty of asking my friends or my sister if they would like some knitting needles with their Chardy, or checking if I can hold their false teeth while they drink it, but I am now eating my words and washing them down with a crisp glass of Chardonnay. Hot tip – Merlot is making a comeback. You heard it here first. Possibly because I am leading the charge. It wasn’t just me who enjoyed the 2013 Single Vineyard Chardonnay. The folks over at the Sydney Royal Wine Show seemed to agree. With a lovely crisp yet delicate finish, the 2013 vintage was a pleasant twist on the traditional creamy taste I often expect in a Chardonnay. Notes of citrus and fresh fruit flavours were evident, and I believe it’s this style of Chardonnay that is surprising the world in a brilliant way. The 2013 Chardonnay was awarded 97pts and was the winner of Best Chardonnay. It then went on to take out the award for Best White Wine, chosen out of 1500 other entries. That is pretty freaking impressive. And just makes me so proud and grateful to live in the Yarra Valley. Yarra Valley wines stand up against, and then walk all over wines from all over the country (and probably all over the world – but I haven’t done the research yet to back that claim up)! There is no surprise Soumah made the cut. The care and love of wine is so evident in the finished product, as well as in the venue itself. I had a great visit to Soumah, and will definitely be heading back there again! For more info check out the Soumah Website or Facebook page! I have not tried any Soumah wines yet, and I have a mate that works there which makes me particularly slack. Your post makes me want to go there even more. Chardonnay with restrained oak is certainly very on-trend at the moment and is changing a lot of peoples’ minds about it. A very good thing. Definitely worth a visit there! Their range was delicious and I was so impressed! Love me a modern chardy – and so does my #Winecat ! It’s the only variety he likes to try and have a taste of, cheeky boy. At least he has an eye for quality. Its been a few years since I’ve visited Yarra now, lots of new cellar doors to explore!